When you take on board a big adventure, you’ve got to make sure you’re well equipped! 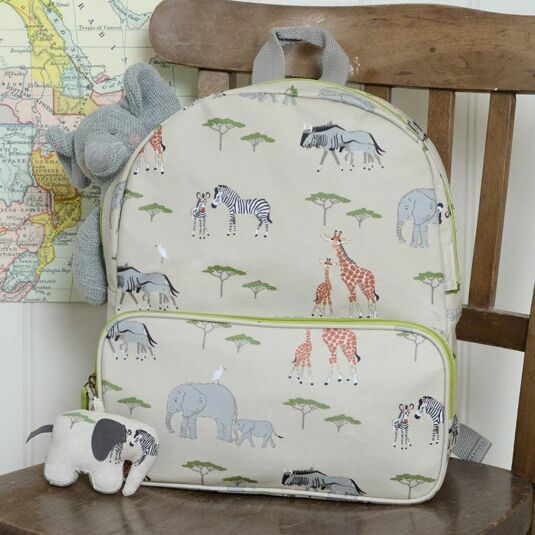 This Oilcloth Backpack from Sophie Allport is the perfect piece to take on that daring safari, or used simply as a school backpack to carry books, lunch and a drinks bottle in! Created from a waterproof oilcloth material to keep the contents safe, this bag features a wheat beige background upon which visions of magnificent animals appear such as giraffes and elephants! A vibrant green trim is found around the edging of the bag, with the colour also used on both zips for the piece. This backpack contains 2 storage areas, a main compartment capable of holding school books, various toys and more with the second storage compartment found on the front of the bag which is great for those secret snacks and goodies your little ones don’t want to share! Allow them to adventure in style with this Sophie Allport Safari Oilcloth Back Pack, an exciting and vibrantly designed fashion accessory they will love to share and show to friends and family, perfect for taking to school, sleepover and on big days out! Our Safari collection is inspired by Sophie Allport’s holidays to Africa to visit family as a child. Elephants, giraffes, zebras and rhinos all feature on the dusty white coloured background. There's a wide range of kitchen essentials plus plenty of homewares and gift inspiration for children and adults!